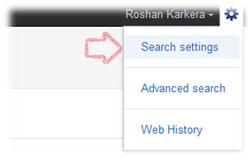 Step 1: Click on Gear icon on the top right corner of the Google Page and Select Search Settings. Step 2: Scroll down the page, Click on block unwanted sites. In case you search on Google and there are results from blocked sites, you may see a message saying blocked results, when you click on Show blocked result, it will show the result on Google, however if you later changed your mind to unblock the sites from Google search result, you can do that by going Manage block sites and Unblock the sites. According to Google, this feature was added to give complete control on the search result and block such low quality sites or sites which you dislike in general like Offensive, pornographic sites. Basically, this effort also paybacks to Google by fighting against such low quality sites and content farms.